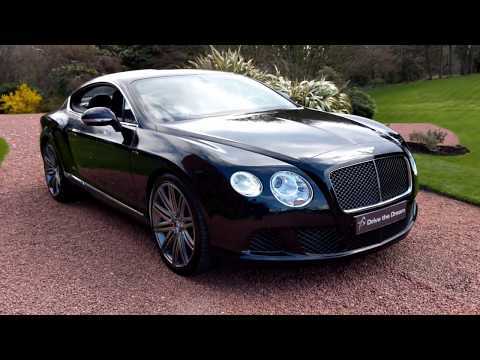 Just arrived in stock we have a stunning Bentley Continental 6.0 W12 Speed Coupe. Offered in Oynx Black with Beluga, A low mileage car with only 12000 miles and benefiting from a full Bentley service record inc December 2015 at 1122 Miles, December 2016 at 4234 Miles, November 2017 at 8277 Miles, December 2018 at 11788 Miles. Specification includes many factory ordered optional extras inc Massage seats and seat ventilation, Heated contrast stitched 3 spoke hide trimmed steering wheel, Contrast stitching on seats including Bentley emblem, Convenience Specification, Red brake callipers, 21 Inch Speed alloys dark tint finish, Diamond quilted hide seats, Drilled alloy sports foot pedals, Knurled sports gear lever, Deep pile over mats to front and rear, Piano Black trim, Storage case to centre console, Bentley tracking system, Rear view camera in addition to front and rear park distance control, Bluetooth telephone system with privacy hand set, Please register early interest.